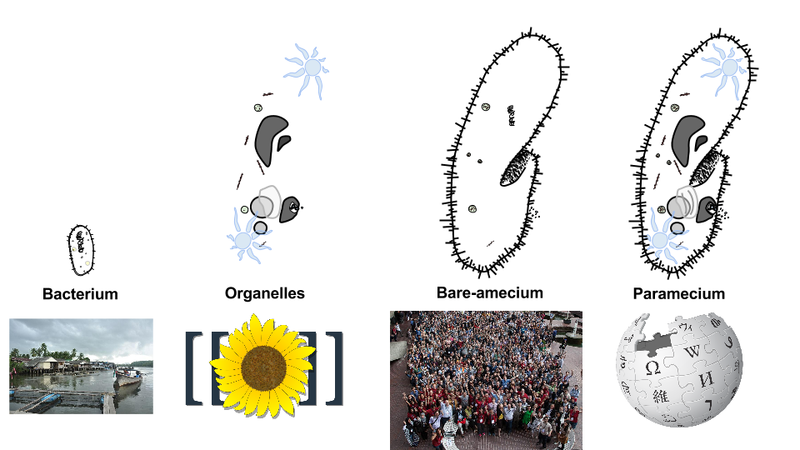 I recently gave a presentation at the Wikimedia Foundation's Research Showcase where I compared Wikipedia to a paramecium. I'll be turning that presentation into a blog post later, but in the meantime, I wanted to share a slide from that presentation that I thought was fun. From left to right: a small village with about 150 people, the MediaWiki software and extensions, the crowd from Wikimania'14 and Wikipedia. Here, I equate organelles to specialized sub-systems of the greater paramecium. In the case of Wikipedia, specialized sub-systems tend to take the form of software.